As you probably know, we've been busy getting a new stamp set ready! Well, here are some sneaky peak cards made with it! All backing papers and accessories from the Winter Days CD! 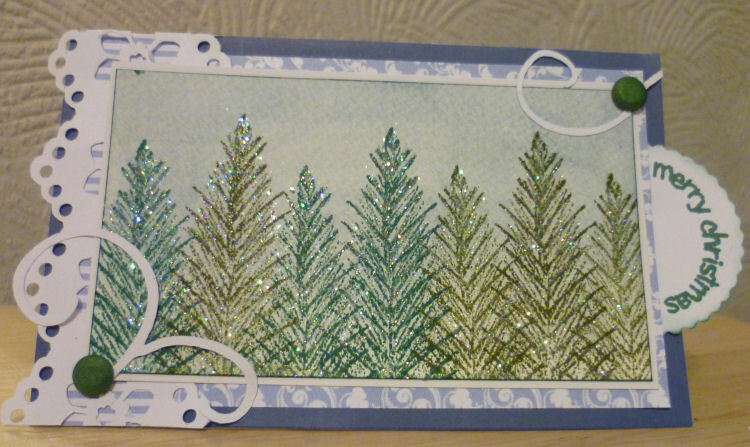 I'm really going to enjoy making my Christmas cards this year! 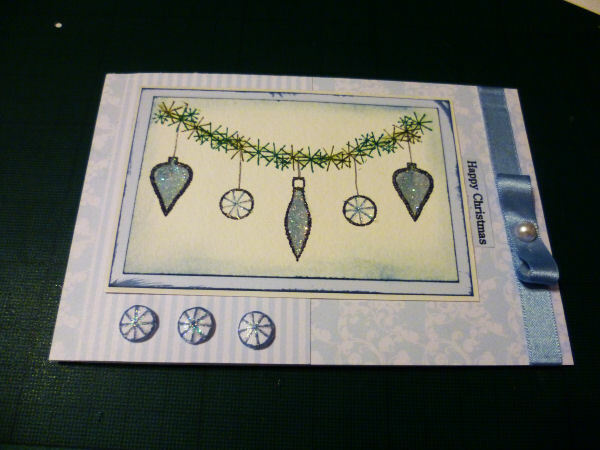 First using Simply Silhouettes, Second using Rosie Puppy & Third using Beautiful Birdies! A quick step by step on registering for our online forum! Press the play button and wait for the word 'skip' to appear in the top right hand corner of the gray box. Click skip and a word (or phrase) will appear. Type this into the answer box. Then scroll, accept the terms and conditions and click submit. You will then have registered! 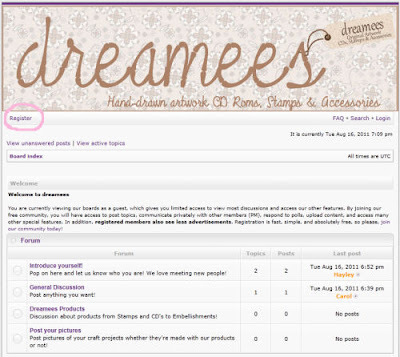 Once registered, and when some adverts pop up click on the dreamees banner (pictured below) at the top of the page to return to the homepage! 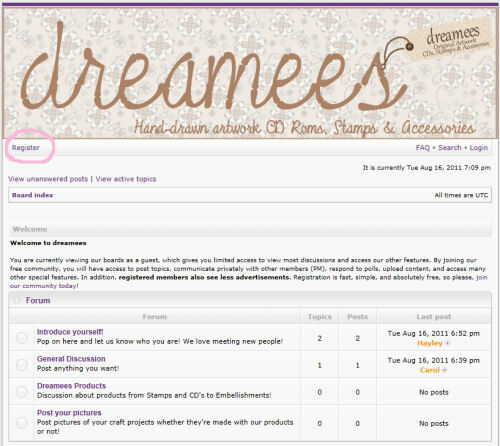 You are then registered and can access the forum to post, etc! 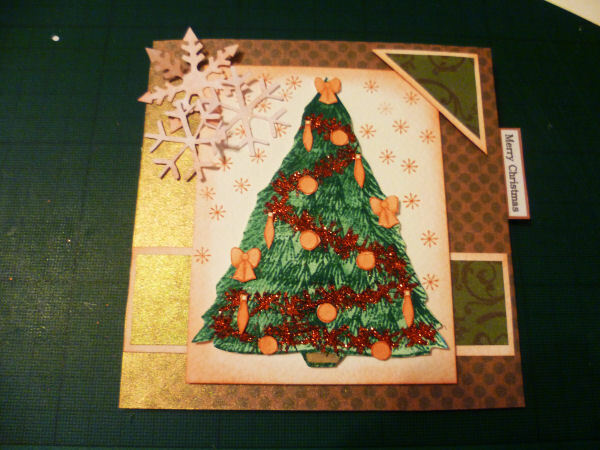 Made using the lovely 'Give us a Swirl' christmas tree! Isn't it beautiful with all the glitter?! So, as many of you know today is Carol's birthday! As usual when it's someones birthday, lots of cards arrived through the post. 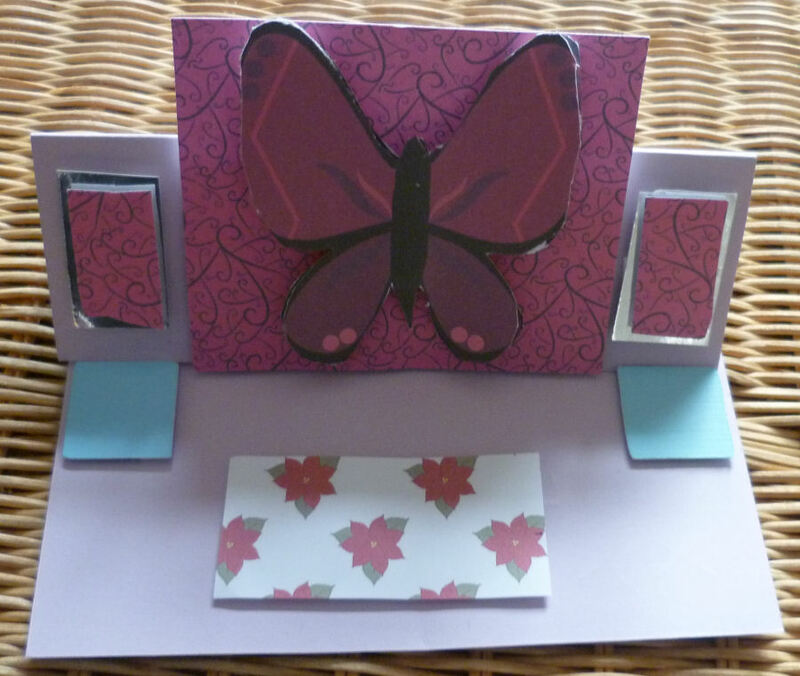 Here is one super special one made by Lucy, age 9, from London! 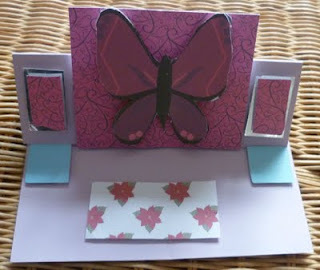 Lucy loves making cards and I can see she's definitely a design team member in the making! How cute is her card? Thankyou so much for sending it Lucy, my Mum loves it and so do I! Made using Winter Days backing papers, 'Saint Nick' stamp, our Poinsettia and leaf pack, lace, etc! Yesterday we were at the National Motorcycle Museum in Birmingham! 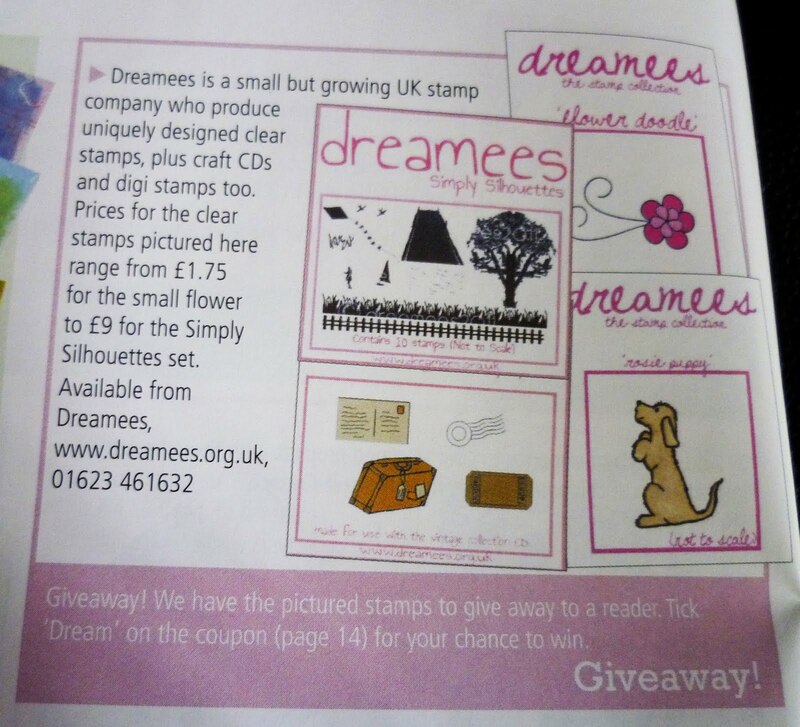 It was a great show as always and we met lots of lovely new people, all eager to see our CD's and purchase their first Dreamees product! Would you believe, last years christmas tree stamps were also a point of interest and sold fast leaving only 2 remaining! That was thanks to this sample made by our lovely Sue Hickey! 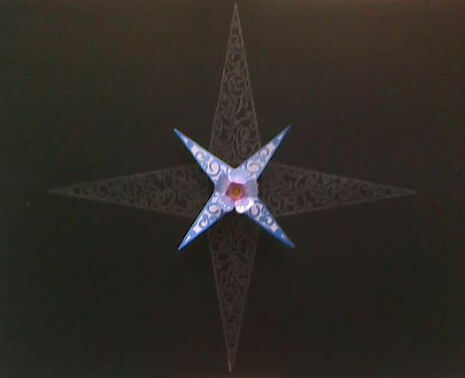 A fan, made with flowers from the Forever Florals CD and the 'Give us a Swirl' christmas tree! Here are some more of the beauties made by Sue! 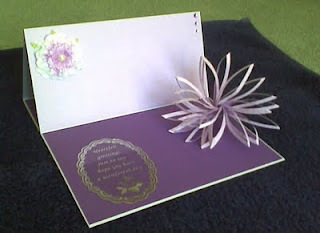 Here are a couple of cards made with Forever Florals by two of our lovely customers! The first, using a fringed flower on a beautiful easel, made by Jane Stillman. 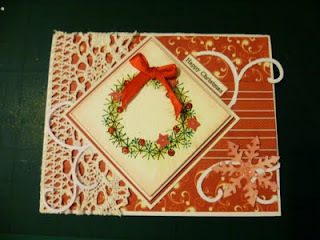 Also, this lovely card featuring roses made by Dawn McCall! I made some for various people who asked for cards for Mum when she got out of hospital! Made with the Teddy Times CD Rom, various flower punches, pearls, swirls from the Cuttables CD, Doily from the Cuttables CD & embellishments! 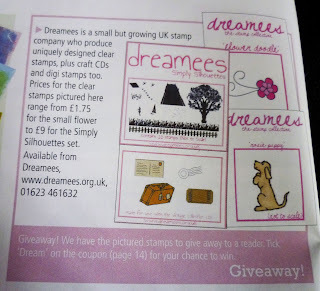 We just received our copy of Craft Stamper as we're featured in the giveaway section this month! Here's a little picture of the feature! The Editor gave us a lovely little write up and she's right! We're growing super fast and it's really great to get such lovely feedback from all our customers! Also, here is a couple of photos of a card Carol has been working on! I updated the blog more aswell - I'm definitely loving it a lot more now! Hopefully it'll give me a kickstart to update it more often!